Now you don’t have to walk into a bookstore to browse through the new arrivals section all the latest from the world of Penguin is now available at one click on your mobile phone screen! 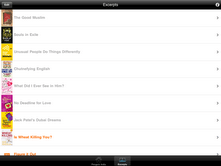 The Penguin App is your one stop access to Penguin books on-the-go. It is an easy-to-navigate, mobile portal with information on all books published and represented by Penguin Books India. The Penguin App is the very first App offered by a leading Indian publisher in the world. It’s a free application aimed at enhancing the reading pleasure and helping the reader find everything he might want to know about. Penguin books available on NOKIA and APPLE devices, and easily viewable on any size mobile screen, the App has a ‘Just Published’ and ‘Bestsellers’ section with the latest books. One can get a sneak-peak into the forthcoming Penguin books as you click on the “Coming Soon” tab. Read up on latest publishing gossip in the NEWS section and sign up for events in your city with a single click on the EVENTS page. And if you want to watch a video, recommend or discuss a book, click on “Stay Connected” and you will be redirected to the ongoing discussions on the Penguin India Facebook, YouTube and Twitter pages.